Proper alignment of your feet and back helps you to work in greater comfort all day. The under-desk foot rest helps you maintain better posture by customizing your work setup. The foot rest features a large platform that's designed to accommodate a wide range of user needs. It is ideally sized at 18 in. x 14 in. (45cm x 35cm) to provide daily comfort and also fit easily under your desk. 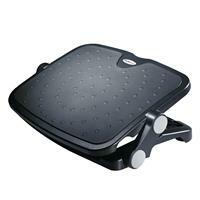 You can quickly adjust the height of the foot rest from 3.7 inches to 4.8 inches. With a simple push on the platform, you can also adjust the angle of your foot rest, with two tilt positions: 0° to 15° and 0° to 30°. These adjustable features allow you to personalize your workstation for greater comfort. The rocking design lets you exercise your feet back and forth, helping to stretch your ankles and calves. 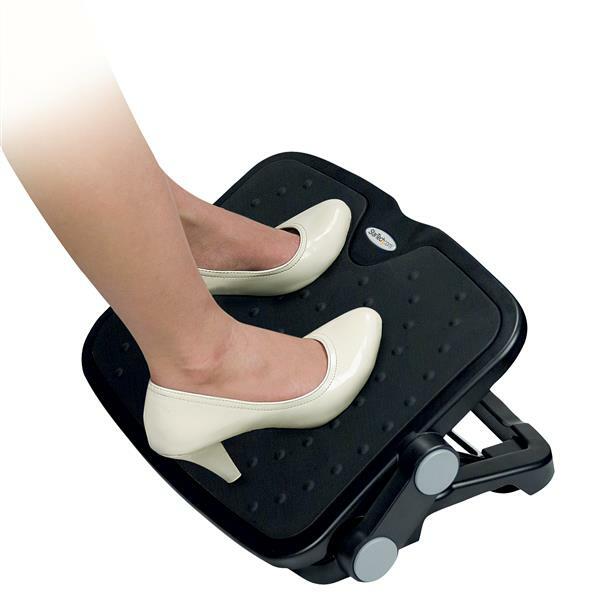 The foot rest elevates your feet to improve your blood circulation and reduce fatigue. The rubberized platform surface prevents your feet from slipping off the footrest. The massage bumps help to soothe your feet during extended periods of sitting. The FTRST1 is backed by a StarTech.com 5-year warranty and free lifetime technical support.